Onion Tomato Chutney is a delicious spicy and tangy chutney that goes well with Idlis and Dosas. This recipe for Onion Tomato Chutney is adapted from Chettinad style Tomato Chutney and is finger licking good. You will love the delicious flavors that will linger in your mouth for long! Chettinad cuisine has strong vibrant flavours, as they use selected fragrant spices in their curries. Chettinad Chicken Curry is another chettinad delicacy in my recipe collection. 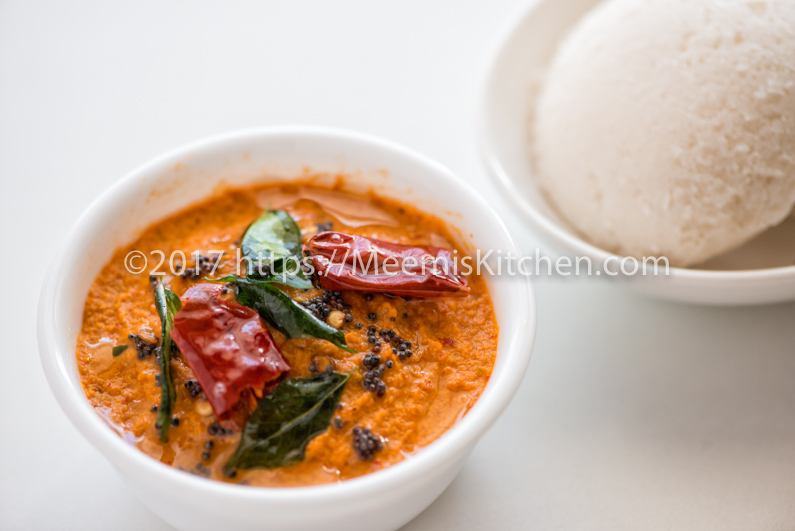 Coconut chutney, sambar and spicy tomato chutney are best combinations with Idli. Idli and Dosas make healthy and nutritious breakfast. Kids love variety breakfast so to please them I make Pizza Dosas, cheese Dosas, stuffed Idlis, Fried Idli in Curd etc. Kids would love this bright colored Tomato chutney with their Mini Idlis. I first tried tomato chutney for my cousin, Sunchi, when he came down to visit me. Although he was happy with the result, I was always on the lookout for a better Onion Tomato chutney recipe and after several recipes and experiments, I reformed this recipe, till I got the perfect taste. This recipe balances the acidic factor very well, making it more appealing and tasty. It is easy to prepare with simple ingredients. You may also enjoy my other chutney recipes like Thenga Chammanthi, Nellikka Chammanthi, Red spicy Chutney, Unakka Chemmeen Chammanthi etc. 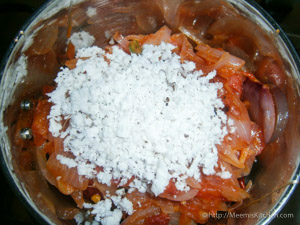 Try this special Chettinad style Onion Tomato Chutney and let me know how it went for you! Enjoy!! Dry Red chilies : 5 – 6 nos. Dry Red Chili : 2 nos. 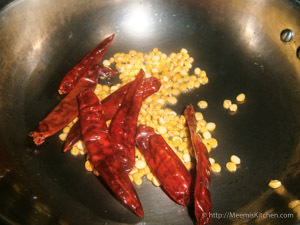 Heat little coconut oil in a pan and roast the Chana Dal and Red Chilies till it changes color slightly. Keep aside. 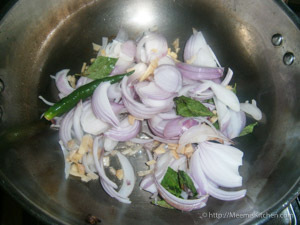 Add little more oil and sauté chopped onions, ginger, curry leaves and green chili. Add enough salt. 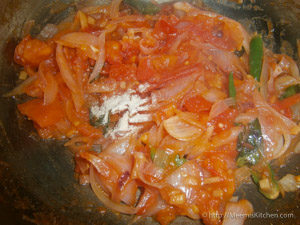 Once it is transparent add the chopped tomatoes and sauté till it is mashed/ cooked well. Now, add the Asafoetida/ Hing/ Kayam powder and turn off the heat. Keep aside for cooling. In a mixer grinder, blend all the roasted ingredients, onion tomato mix and grated coconut to a fine, slightly grainy paste. Transfer to a bowl. For garnishing, heat oil in a pan, pop mustards add curry leaves and red chilies. Pour this over the chutney and serve hot with Idlis or Dosas. Please adjust the spices according to your spice level. Add more or less red chilies as per your liking. This Onion Tomato chutney has roast Chan Dal that gives it amazing flavors and adds thickness to the gravy. No garlic should be used. 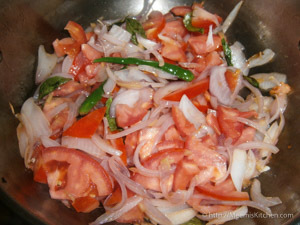 The tomatoes and onions should be sautéed till they are mashed to get the perfect taste. Always make sure you add just the exact measure of coconut. You may grind the chutney to a slightly grainy paste or smooth paste as per your liking. No water should be added.